Are you fiending for a sweet treat, but so over/bored with the recent explosion of ice cream and cupcake options? 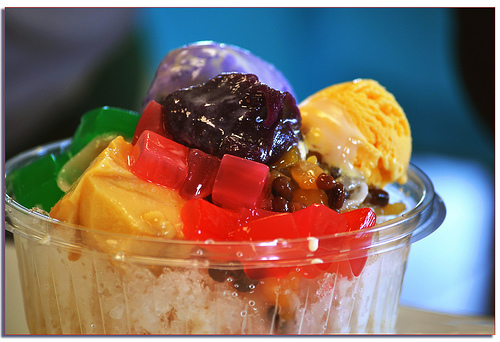 I present to you halo-halo, the sweet and cold and crunchy and chewy and melty and perfect Filipino dessert (or questionably nutritious dinner substitute). From the Tagalog word for mix, halo-halo’s possible ingredient permutations are endless, but the dish I revered last night at Kawali Grill (AC!) comprised coconut gel, sugar palm, jackfruit, banana, tapioca pearls, milk, sugar, and shaved ice, topped with ice cream and leche flan. The near-glowing bowl arrives at your table frosty and bright, each ingredient popping with neon glory. Savor the sight for a moment before mixing aggressively for proper taste distribution. While fleeting, the joy instilled with each drippy, now uniformly purple spoonful builds a cooling fortress against stultifying heat. If you go alone, bring along headphones and tunes, ideally these guys, to distract you from the sonic booms overhead. Also of note, this bowl is particularly satisfying as a follow-up to a bowl of a different sort.